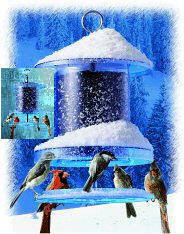 Through rain, snow, sleet and ice, our All Weather Bird Feeder delivers your seed DRY!! This unique all weather bird feeder is designed to keep rain and snow out so your seed stays fresh and dry. Won't clog up with snow and ice, and saves you the trouble of cleaning out wet, frozen or moldy seed. The covered feeding port prevents seed from getting wet even if rain or snow is blowing horizontally. Birds reach up under the covered feeding port and pull the seed out from a circular slot. 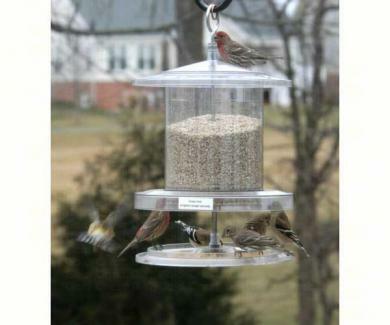 The circular perch lets you see all the birds that are feeding, even those on the far side. The bottom seed tray catches spilled seed and is easily removed for cleaning. In fact the whole feeder comes completely apart so each piece can be individually cleaned. A clean and healthy bird feeder keeps our wild bird population healthy. Constructed of unbreakable UV-stabilized polycarbonate resin and stainless steel hardware throughout. Dimensions:6 quart model is 20-1/2" tall by 10-1/2" in diameter.